Athens, Greece – On Thursday night, Greece and the Former Yugoslav Republic of Macedonia (FYROM) are due to put to rest a 27-year dispute over the latter country’s name. Following months of heated debate, the Greek parliament is scheduled to ratify the Prespes Agreement reached last June. FYROM agrees to abandon “Republic of Macedonia” – the name it chose for itself when it declared independence from Yugoslavia in 1991 – and call itself North Macedonia. Greece agrees to lift its veto to North Macedonia’s membership in NATO and the European Union. A source of instability and ill feeling in southeast Europe is thus removed. In Skopje, social-democrat Zoran Zaev was soundly beaten in a referendum on the deal; he ratified it in parliament by luring eight MPs from the nationalist VMRO party across the aisle. “The key position of the Greek state for many, many years — not since 1991 when this state was created but long before — was that we do not want any of the states of the area to monopolise the word Macedonia or Macedonian,” says Angelos Syrigos, professor of international law and foreign policy at Panteion University. That is why Greece insisted that its neighbour qualify the term Macedonia with an adjective. 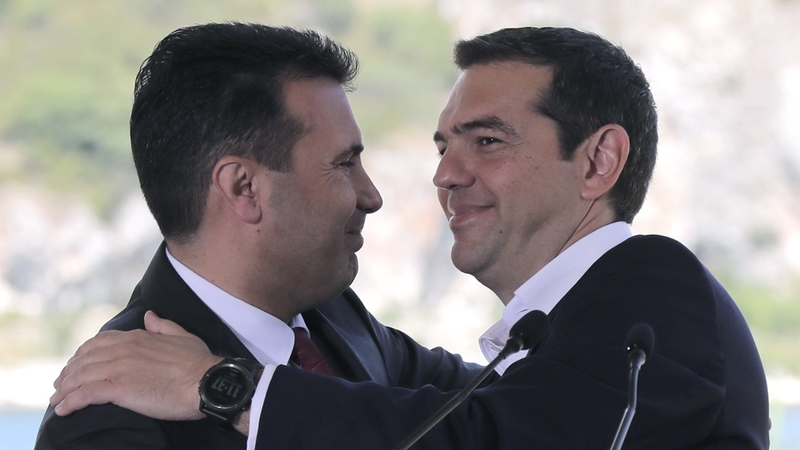 Last year, both sides agreed to “Severna Makedonja”, or “Northern Macedonia”. However, the same qualifier does not carry over to state attributes such as nationality and language. These remain “Macedonian”, and that has upset the Greeks. “If you give nationality, if you give the language, this is called identity. And we do not want to open the door to one of the states to have the right to monopolise the Macedonian identity,” says Syrigos. The Greek position is that once established, such an identity can create a basis for territorial claims. Naum Stoilkovski, VMRO spokesman, sees the identity issue in reverse. “You can’t rename all of Macedonia’s institutions, you can’t erase all that is truly Macedonian,” he tells Al Jazeera. “There is no better way to secure that they won’t become a pawn of foreign powers – Turkey or whoever – than to ensure that they become a very close ally and partner to Greece,” Says Ioannis Armakolas, professor of comparative politics in southeast Europe at the University of Macedonia in Greece. The previous, hardline administration in Skopje claimed ancient Macedonian heritage and erected gigantic statues to Alexander the Great and his parents, Philip II and Olympias. This alienated Greeks, who see ancient Hellenism as a key constituent of their modern history and nationhood. Zaev denounces that policy, and has gone to great lengths to separate Greek and Slav Macedonian identities in the Prespes agreement. Today’s Balkan borders were largely set in 1912-13, when Greece, Serbia and Bulgaria fought the dying Ottoman Empire for its European possessions. In the Treaty of Bucharest, Greece got 51% of geographic Macedonia, Serbia 39% and Bulgaria 10%. Not until 1946, when the Federal Republic of Yugoslavia was formed, was Serbia’s south named Makedonija, and it assumed a Stalinist ambition, articulated at the seventh Communist International in 1934, to create a “unified and independent Macedonian nation” by reuniting the Greek, Bulgarian and Serb territories carved up in 1913. Greece’s Communist party vigorously supported the idea. During the 1946-49 Greek Civil War, Yugoslavia supported Greek communists with arms and materiel in return for a promise that Greek Macedonia would be annexed to Yugoslav Macedonia. Many Greeks believe that Tito weaponised Slav Macedonian identity as justification for expansionist designs and that this mentality cannot be erased from the new state’s DNA. It is easy to see why, when Yugoslavia broke up and the Republic of Macedonia was proclaimed, Greeks viewed the entire project as the reincarnation of Communist hegemony.